7 am staff was rolling huge bins outside, really loud. No coffee in room so tried to shower. No hot water. Was warmish for like 3-4 mins, thinking it would be fine, I got in.. only to have it turn ice cold. Staff on check only asked if I let it run. Yes, I did. Oh well. We won't stay here again. Room was smaller than expected however it was clean. Staff was a little too serious (no smiles) but respectful and did answered all of my questions. Vallet/Bell man employee who "welcomed"us was not friendly but overall experience with everything else was good. Great location. Wonderful staff. The room was rather threadbare and very small. nice hotel, close to everything. however pool water cold, website was false, showed 2 pools and a cafe. no cafe. no mention of the $30 parking fee either. Great location and friendly staff. One block from riverfront and French Market. Close to Café du Monde and trolley stop. The hotel was perfect for its location to everything. My husband and I enjoyed its beauty and historic look. We would stay here again!! Excellent room - worthy of the French Quarter. Convienient location to Jackson Square and the French Market. Was looking for a place in the French Quarter and couldn't have been more pleased. For me the location was perfect, close enough walk to Bourbon Street but far enough away to be quiet at night. Super close to Jackson Square and the riverfront. I like that area of New Orleans better. Nice room, hotel has a lot of character. We are from near Lafayette, LA, and come to NOLA once or twice a year for various reasons. We have found Hotel Provincial to be our go-to place. It has on-site parking which is hard to find at French Quartet hotels, the staff is attentive and friendly. We have found that in New Orleans It pays to tip tip tip, no matter what hotel you stay at. Don't be cheap. Pass the valet/bellhop guy a $10. It will be well worth your money. The Hotel Provincial is comfortable and very convenient to Bourbon Street, the French Market, Decatur Street and the Riverwalk. It is close enough that you can walk back to your hotel room to pee if you have to. Absolutely wonderful location! Close to everything while still retaining a quiet ambiance. The room was nicely decorated, comfortable beds and updated decor. The pools are small but quaint. Loved the courtyard. The front desk personnel could have bit friendlier and more welcoming at check in. The rest of the personnel was great though. Very charming hotel with an authentic New Orleans feeling. Will come back! Stayed during Mardi Gras festival. Everything was walking distance. Bourbon street was no more then a 10 minute walk. Very close to all the action but yet far enough away that we were able to get some quiet time to sleep! Will definitely stay here again. The location worked out perfectly for us given the activities we chose to do while in New Orleans. The room was clean and the bed was comfortable. Every member of the staff we came in contact with was pleasant. We would stay here again. Good location in the French Quarter. On site parking. Charming courtyards and rooms. 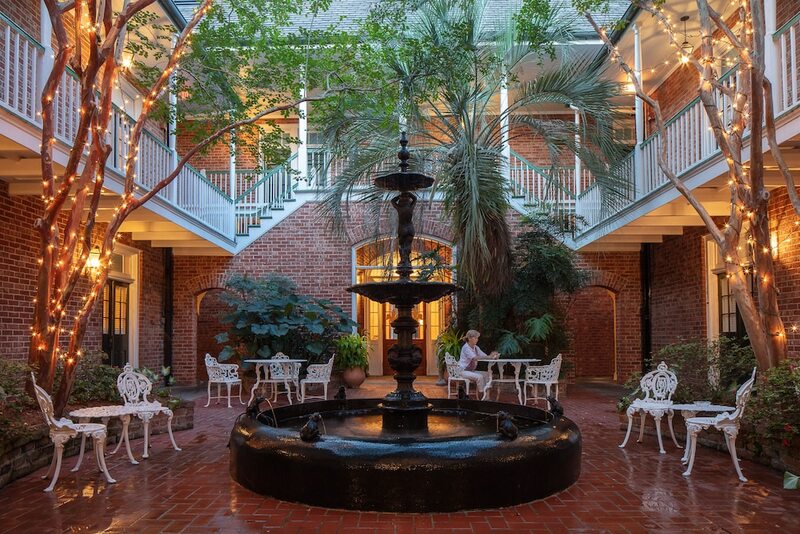 Located in French Quarter, Hotel Provincial is next to popular attractions like Old Ursuline Convent and French Market. This 93-room, 3-star hotel welcomes guests with 2 outdoor pools, a restaurant, and free in-room WiFi. You can enjoy a drink at the bar/lounge or visit the onsite restaurant for a bite to eat. For your convenience, a full breakfast is served for a fee each morning from 8:00 AM to 1:00 PM. A flat-screen TV comes with cable channels, and guests can stay connected with free WiFi. Beds sport premium bedding and the bathroom offers a hair dryer and designer toiletries. Other standard amenities include a refrigerator, free newspapers, and a safe. Guests of Hotel Provincial enjoy features like 2 outdoor pools, free WiFi in public areas, and a meeting room. Valet parking is offered for USD 31 per day. The 24-hour front desk has staff standing by to help with securing valuables, luggage storage, and dry cleaning/laundry. Other amenities at this historic hotel include coffee/tea in a common area, a computer station, and free newspapers. Full breakfast is served daily from 8:00 AM to 1:00 PM for a fee. Ice House Bar - Cocktail bar specializing in southern cuisine. Open daily for breakfast and lunch. French Toast - Restaurant open daily for breakfast and lunch. The preferred airport is New Orleans, LA (MSY-Louis Armstrong New Orleans Intl. ): 26-min drive, 16.4 mi/26.4 km.